TROOPER SAYS YES: IT'S ALIVE!!! Often the death of a character or individual can be distressing. Not so in a t-shirt or character design, as more often than not they just tend to take on a new lease of life. Which is a bit of a contradiction really. 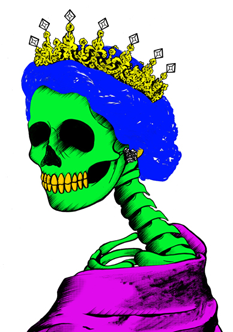 zombie queen was a lot of fun to do, and really quick in terms of brush work that went into it, much looser way of working than i normally ink stuff.